Playing with Electrons to Make Stories: Small Post. So, I have been kinda dry in the imagination department. This is all I was able to produce today. I wanted to post at least something in the hopes to kick-start my flow. This is just a small hallway description for my Tower dungeon. Lights flicker, creating the illusion of subtle movement in a debris strewn hall. Papers in crumpled piles dot the checkered floor tiles, desks overturned to form barriers, chairs broken and blackened mark spots where fires had burned. Bare walls, colored yellow and water stained, cracked plaster dusting the tiles. Walls, floors, and ceilings corkscrew away from the entrance in sudden turns, gravity staying with the checkered path. 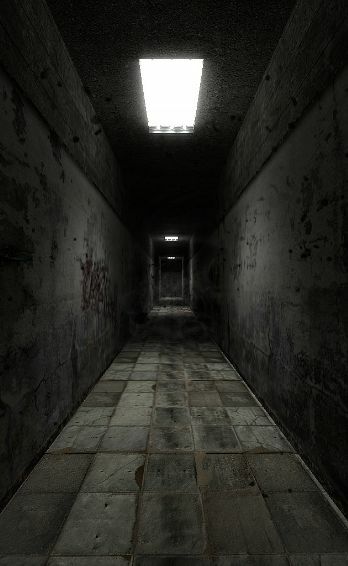 Lights flicker is succession down the hall, making it seem to visibly stretch as the light moves away. Moving down the hallway, the perception of time vacillates between extremes of brevity and magnitude. Each step is juddering, an uncertain stride that may cover yards of space or a modicum of inches. It all ends after prolonged moments of travel, the terminus a metal hatch at the foot of solid stairs.